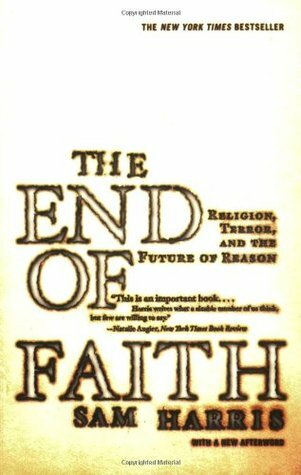 Harris's "The End of Faith" is an interesting, lively read. I agree with nearly all of what he says, but I am left disagreeing with his conclusions. There is something at the core of this book that is too narrow, and too certain. Harris's arguments against literal, faith-based interpretations of scripture are intellectually unassailable, yet they show a certain unwillingness to play the human game. It is easy to point to the Garden of Eden and note that it features a talking snake, which is biologically improbable. It is more difficult, and more rewarding, to ask what the story is getting at. One might ask WHY people have such powerful responses to these narratives that they are willing to affirm them, even when they contradict reason and evidence, even at the cost of their lives. A poem is not diminished when it is translated into literal language; it is killed altogether. Religious parable, too, cannot be articulated in rational form without dying. Harris argues that the time has come for us to kill religious parable, because its particular expression of unreason is leading us to the brink of calamity. What he does not acknowledges in this book is the baby being thrown out with the bath water. Some arguments are irrational, but some are non-rational. Symbolic forms are non-rational because they are non-propositional. To treat symbolic forms as 'error' is to miss the point. The fact that religious thinkers often confuse symbolic forms of expression with literal statements is hardly the fault of the literature. Those persons will not be made more rational by the rejection of religious narrative. Is religious material the cause of the kind of uncritical reflection that poses a grave threat to our world, or a SYMPTOM of uncritical thinking? Would G. W. Bush make a better philosopher than theologian? Many reviewers have pointed out that it is not religious material per se that is the problem, evidencing disasters such as Maoist China, Soviet Russia, and Nazi Germany. Harris's reply is unconvincing. He argues that this is consistent with his analysis, because the true target of his book is dogma, not religion. Harris cannot have it both ways. One need only leaf through the book to see that he is plainly NOT attacking dogma, he is attacking religion. His argument conveys a sense of vendetta that undermines its persuasiveness through its single-mindedness. His appeal to Buddhism as a possible form of rational exploration of religious issues does not convince us otherwise, because his version of Buddhism is so decontextualized from its own religious, narrative base that it is no longer recognizable. Two pages of footnote caveats will not persuade any reasonable reader of this book that Harris does not think the problem is religion. He has not effectively made the case that the problem is religion per se, and he has not convincingly come to terms with the unique qualitites of religious narrative. Nor has he accounted for the ubiquity of religious narrative. Surely if Darwin is correct, then there must be an adaptive significance either to religious thinking, or the types of thought that give rise to religious thinking. Despite my significant disagreement with Harris's interpretation, this is still a fine and worthwhile book by any standard. He is an eloquent, courageous, and entertaining author with considerable intellectual powers. He makes a case that many would hesitate to argue in today's intellectual climate in the US, and he makes it vigorously and well. This book has challenged me and changed my thinking on a number of important topics. Sign into Goodreads to see if any of your friends have read The End of Faith.